A movement exercise form of dancing to the bars of music as well as a total body workout. Classes focus on stretching and strengthening with music ranging from choral arrangments to funk. 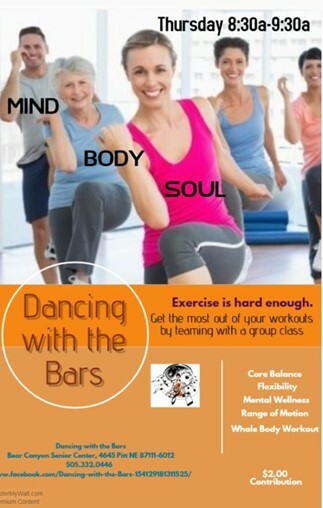 No there are no poles, no ballet bars…..Dancing with the Bars is a movement exercise form dancing to the bars of music. Is a fun way to have a fit, toned body and serene mind. Remember what it felt like as a youngster to skip, jump, imagine and dance for joy? This is a fusion fitness exercise class method that tones your body, mind and spirit. Dancing with the Bars will fit your personal needs and can be experienced by anyone: male, female, old and young; it is “user-friendly”, playful and easy. Routines vary from class to class. Though this is a total body workout, some classes may focus on stretching and strengthening a particular part of the body. The music changes too, ranging from ecclesiastical choral arrangements to funk. Dancing with the Bars does not require any equipment. Some benefits include increase in the pleasure of your body, weight loss and maintenance, increased range of motion, improved muscle tone and strength, better balance and stabilization, more endurance, better ability to deal with stress and stay calm, improved posture, better concentration, a happier emotional state and more. During the class you will come across the influence of dance, martial arts, and the healing arts. The result, a fusion of movement styles freer than other cardiovascular-based exercise. The comforting movement and stretching will melt away your tension and at the end of the class you will walk away with a “feel good” feeling that will begin your day.